Come November and Haryana Chief Minister Om Prakash Chautala will be again going on a foreign trip. This time he will visit Tunisia and Denmark. In a significant achievement, a major component for fighter aircraft MiG-27 of the Indian Air Force has been developed at Ambala. The Haryana Government today clarified that the residents of authorised areas, including the sectors developed by Haryana Urban Development Authority, colonies approved by Director of Town and Country Planning, Improvement Trusts schemes and regularised colonies did not need to produce any no objection certificate (NOC) before the registration authorities, in case no division of their residential plot was involved. The Haryana Rajkiya Adhyapak Sangh has expressed resentment against the rationalisation being carried out in the Education Department alleging it is part of a conspiracy to ruin the department. Stories from Haryana towns falling in the National Capital Region are put in NCR Tribune. Private colleges which get grant-in-aid from the state government will soon be facing a tough time following the government's step to prune funding of these institutions. The process to regularise 13 unauthorised colonies has been initiated by the Municipal Council, Ambala Sadar. The Deputy Commissioner, Ambala, Mr D.D. Gautam, said notices were being sent to 1600 families living in the colonies for getting the house registered. The police today arrested Krishan of Patti Afgan Kamal from Delhi, main accused in the murder of Kartar Singh, who was shot dead here on January 22. The victim was a relative of former Haryana Minister, Mr Roshan Lal Tewari. The former general secretary of the Sanatan Dharm Sabha, Ambala City, and social activist, Bachan Lal, died when he was hit by the Shatabdi while crossing the railway track here today. Bachan Lal was an active worker of the Jan Sangh. He was 71 years old and is survived by three sons and a daughter. Women police stations one each in the four ranges of the Haryana police, have been sanctioned to provide a more sensitive and responsive treatment to them. Mr Rambir Singh, MLA, Pataudi Assembly constituency, assumed charge as Chairman of the Board of School Education, Haryana, here today . The programme of the Chief Minister to hit foreign destinations once again, soon after having done a trip abroad in June, is likely to trigger off the ire of the Nil's political opponents who have alleged that trips being undertaken by the Chief Minister are in the nature of junkets. State government sources, however, claimed that the two trips undertaken by the Chief Minister so far were splendidly successful. Tunisia, it may be stated, was dropped from Mr Chautala’s itinerary at the last moment when the trip undertaken by a state government team led by the Chief Minister in June had to be rescheduled due to the ongoing farmers agitation in the state. Similarly, the Chief Minister’s trip to China was also cancelled due to the agitation. Mr Chautala, however, caught up with his programme in China by visiting the country on his return from USA, Canada and countries in Europe. While Tunisia was dropped from his tour programme, Denmark is a new destination chosen for his next foreign visit. The growth of dairy industry in Denmark was of particular interest to Haryana, official sources here said. From both Denmark and Tunisia, Mr Chautala reportedly has got standing invitations. Tunisia, a country in the African continent, does not have much to offer in terms of technology or industrial investment. However, management of the rural economy in Tunisia could be useful for Haryana while the state government team would also explore possibilities of adoption by Tunisian NGOs of some of Haryana villages to pave way for development of these villages. The Chief Minister had already agreed in principle to undertake the trip, official sources said, adding that in all probability they would set off for foreign destinations on November 2. Initially, the plan was to make the trip in October but it would not be possible in view of session of the Assembly during that month. The Instruments Design Development and Facilities Centre (IDDC), a UNDP-assisted R&D project of Haryana State Electronics Development Corporation (HARTRON), has received technical approval for the development of laser optical window which is used in MiG-27. This development is significant since it will enable saving of precious foreign exchange. The component is being built at a cheaper cost compared to prevailing international price. The laser optical window or KLEN Glass, used in MiG-27, is “mounted for the facilitation of laser transmission greater than 96 per cent at 1.06 Micron at laser beam incidence angle of 20-50 degrees.” In effect the laser optical window considerably enhances the strike efficiency of the fighter aircraft MiG-27. Project Manager P.K. 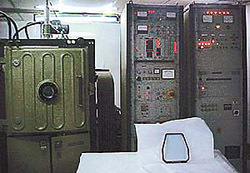 Goel said that the laser window helps in the reception of laser signal received from ground target for its further simulation in Laser KLEN-PM system. The team of optics engineers, including Mr C.C. Tripathi, Mr S.S. Solanki and Mr J.K. Gangwar and technicians at IDDC, have put in considerable effort over the last one and a half years to develop the component. They were instrumental for design development, fabrication, coating and test plan of KLEN Glass. An engineer said that the IDDC has developed the component, which is an import substitute, after at least two well-known organisations had not managed to develop it. The optical window developed by the IDDC has been tested at various laboratories. It has passed air-borne test requirements like blow rain, salt fog, sand & dust, random vibration test, high temperature test, thermal, humidity, combined temperature altitude and humidity tests performed at labs, including ISC Bangalore, CQAL, Bangalore, and HAL, Nasik. The import cost of laser window is more than Rs 2 lakh in international market. To begin with, IDDC is all set to supply four laser windows to HAL. A larger order for the laser optical windows may be placed soon. Mr P.K. Goel said that the IDDC for the past several years has been in the process of developing optical components for air-borne equipment. In its process of design development, IDDC optics section has developed various components for HAL like Rear View Frisms, Optics for IR range, Gun Sight Reflector, Elliptical Mirrors, Filters like red, green and orange. “These components are import substitute and are being supplied regularly to HAL, Nasik. As a result of indiginisation of these components, a lot of foreign currency is being saved for the country,” he observed. “In the year 1991, Optics group was awarded with NRDC award for the development of Guidescope. It is being used by the defence for the tracking of projectile trajectory missiles in the initial ten seconds,” he added. A spokesman of Haryana Urban Development Department said like the Executive Officers of Secretaries of Municipal areas, the district Town Planners would also forward the list of approved colonies or authorised areas to registration officers so that residents of these areas did not have to produce any NOC before the registration authority for sale of their residential plots not involving any division. He said the guidelines already issued also point out that the NOC would be deemed to have been issued for a bona fide sub-division as a result of family partition, inheritance and succession. The guidelines already issued also provide for mandatory disposal of NOCs within 15 days of the receipt. In a press release the district president, Mr Raj Singh and spokesman Shakti Singh said here today though the new session started three months ago but books were yet to be delivered to schools. The spokesman stated that according to the educational calendar admissions had to take place between May to July, but rationalisation was being done as per the enrolment of students on May 18 and teacher-student ratio had been decided as 1:65. He alleged that the department had issued the calender later and private schools had started their admissions from April 1. The leaders said no commission had recommended ratio beyond 1:25 as yet and directions of Centre were too for 1:40 but in Haryana it is 1:65 for Primary Department and more than 1:60 in Secondary Department. They termed it as an exercise to reduce expenditure by minimising the post of teachers. Official sources here said that there were 97 private colleges in Haryana which received financial support, to the tune of 95 per cent of their recurring expenditure, from the state government. The annual expenditure on the count cost the state government around Rs 82 crore. Official sources here said Chief Minister Om Prakash Chautala had asked the Finance Department to work out a formula to progressively reduce funding of these colleges in a phased manner over five years at the end of which state government would totally stop funding. This step, the sources said, was in tune with the state government's policy to end subsidizing the higher education sector. In lieu of state government's financial support, these colleges will be expected to manage their expenses by attracting students by offering quality self financing courses. Already 20 colleges were in existence in Haryana which were being run without any state government support, stated the sources. The process to regularise 13 unauthorised colonies has been initiated by the Municipal Council, Ambala Sadar. The Deputy Commissioner, Ambala, Mr D.D. Gautam, said notices were being sent to 1600 families living in the colonies for getting the house registered. This process would enable the residents to become house owners and it would also be a revenue-producer for the Municipal Council, a release said. In the notices, the residents of these unauthorised colonies had been asked to deposit within one week, necessary documents like the building plan. These colonies had come up before the Independence. The local MLA, Mr Anil Vij, raised the issue of these colonies in the Assembly. On the direction of Haryana Chief Minister, Mr Om Prakash Chautala, a high-level meeting had been called which was presided over by the local Bodies Minister, Mr Subhash Goyal. The unauthorised colonies which were regularised included Valmiki Colony, Bakra Market, Bandhu Nagar, Bazigar Colony, Gujarati Dhakka Basti, Mohra Basti, Indira Colony, Deha Colony, Rangiya Mandi and Dera Basti BC Bazar. District police chief A.S. Chawla told mediapersons here that three others involved in this murder were arrested earlier. The gang leader Krishan was evading arrest by changing hide-outs and despite raids to arrest him the police did not succeed. The SP added that a CIA staff team on a tip-off left for Delhi and set up a naka in Nazafgarh area of Delhi. As the accused was noticed coming on a motorcycle he was overpowered by the police. The accused confessed his hand in the murder of Rajinder Pehalwan of Pharain village in Jind district and the murder of Kartar Singh, the SP added. According to information, the accident occurred when Bachan Lal tried to cross the railway line near the wholesale cloth market here in the morning. He died on the spot. Leaders of the BJP, including former MLA, Master Shiv Prashad, reached the railway station. Staff of S.A. Jain Senior Secondary School and members of the Sanatan Sabha also rushed there. Later, his body was shifted to the local Civil Hospital for post-mortem. He was cremated in the evening. The railway crossing is prone to accidents and many persons have lost their lives while crossing it. People of Ambala have been demanding either an underground bridge or an overbridge on this crossing for a long time. This was stated here yesterday by Mr M.S. Malik, DGP Haryana while releasing a citizens’ charter in the Madhuban police complex. The citizens’ charter contains information about various activities of the police. Mr Malik said information received by the police would help combat crime successfully. The police would serve people with the motto “Sewa, Suraksha Sahyog”, he added. Spelling out his priorities, Mr Rambir Singh said the eradication of the evil practice of copying and raising the standard of education were on top of his mind. He said to ensure this an anti-copying campaign would be launched. He stressed the need for co-ordination between the board and the Education Department. Earlier, on his arrival at the board headquarters, Mr Rambir Singh was welcomed by the board Vice-Chairman, Mr Dilbagh Singh, the Secretary, Mr M.S. Mor, Mr Shashi Parmar, MLA, Mr Rambir Singh Mandola, MLA, besides employees of the board and people of the Pataudi constituency. Dr M.L. Ranga, Health Minister, was also present. The Haryana Chief Minister, Mr Om Prakash Chautala, was presented with a cheque for Rs 15 lakh for the Chief Minister’s Relief Fund by the Chairman of the Haryana State Cooperative Apex Bank, Mr Ramphal Kundu, here today. The Principal Secretary to Chief Minister, Mr M.K. Miglani and the Managing Director of the bank, Mr J.P. Yadav, were also present on the occasion. ‘Chetna’, a play by Mr Madan Lal Sharma, former Principal, Gita Niketan residential school, Kurukshetra, has been selected for the Haryana Sahitya Akademi Award. Stating this to mediapersons here, Mr Sharma said this book was written on the eve of the International Year of Woman and released by Dr Sumitra Mahajan, Union Minister of State for Woman and Child Welfare Department, Government of India, at a Mahila sammelan held here on July 9, 2001. Mr Sharma will be awarded Rs 10,000 as cash prize and a certificate of appreciation. The Haryana Government has appointed presidents of District Consumer Forums of Ambala, Narnaul and Rewari. Mr Radhey Sham Sharma of Fatehabad has been appointed as the president of the Ambala forum, Mr Krishan Kumar Malik of Sonepat as the president of the Narnaul forum while Mr Om Parkash Chopra of Narwana heads the Rewari forum.